I have been a collector of "things" for years and frequent flea markets and antique shops in my quest -- you name it and I probably have a collection going. Fabric has always been one of my passions along with buttons and trims. My mother taught me to sew when I was young and more importantly, how to rip. Sewing has always provided me with a sense of accomplishment and pleasure in combining fabrics of varying colors, prints and textures to create something new and different. After sewing garments for years I decided to try handbags to use up some of my special finds. 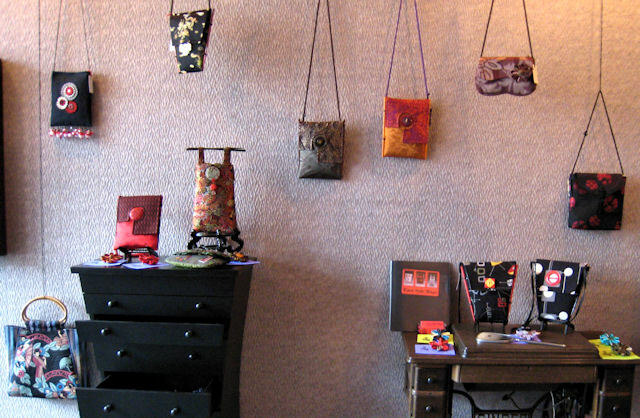 Handbags require no "fittings" and they are functional - your artwork is taken out on a daily display and serves a purpose. Handbags are also a good medium for experimenting with fiber techniques and ideas you might not want to try on a large scale. 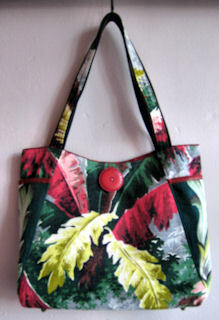 I also enjoy the challenge of finding and repurposing fabrics or garments into handbags. One of my first bags was made out of a vintage oriental barkcloth print, formerly a chair cushion in my grandparents' house. I have also worked with placemats, curtains, neckties, slipcovers and vinyl game boards, turning them into unique one-of-a-kind handbags. The more unusual the textile the more challenging and interesting it can be to work with. 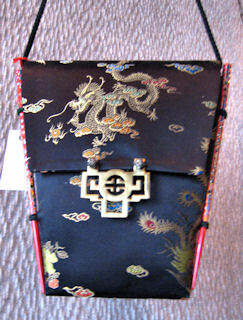 I've always loved oriental style items and decided to use chopsticks as handles on one of my bags. This led to the discovery of the many different ways that chopsticks could be used on bags, not only as handles but also for support and in decoration. I'm also intrigued with using unusual items to decorate my purses - such as fringe made from keys, subway tokens or fishing bobbers. Vintage felt pennants, game pieces, silverware and jewelry have also made it on to my bags. I love to go into my sewing room and create, not quite knowing how things will turn out until the end. Choosing the button and trim to compliment the bag is a fun process as I get to sift through my collections again. A good day in one where I am still in my pajamas at 5 pm, sewing away, unable to stop until my creation has come to life. The East Side of Madison where I live is a fun, interesting, eclectic side of town. I decided to name my company East Side Bags to reflect where I live and also my fascination with all things from the Far East.